White is the most traditional color for weddings. Just because something is traditional, however, does not mean that it cannot be fresh or original. These are some ideas on how to design a perfect white wedding, from classic to contemporary. First of all, do not fear that a white wedding will look bland or boring. You do not need strong color to add visual interest. That can be achieved by layering various shapes, textures, and forms, without the addition of extra colors. Some brides might choose to add a dash of silver or another very pale color like rose or baby blue to their white wedding palette, but all-white can be just as stunning. 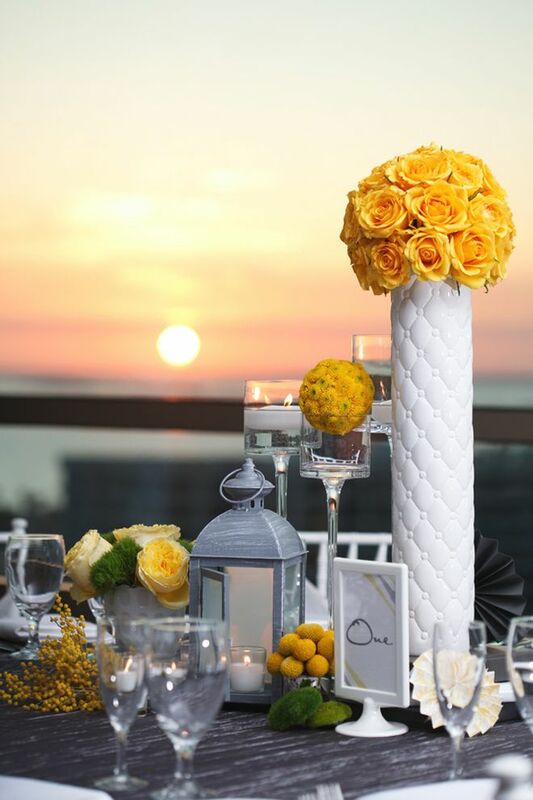 Define the style of your wedding, and then choose the white accents that will help to bring your vision to life. You can create very different effects, depending on the flowers, bridal gown, and décor that you select. An all-white wedding can be anything that you like, from very traditional to casual to modern, but it will always be chic and elegant. The classic white wedding will always be in style. For this type of affair, look for things that evoke a timeless grace. A silk and lace wedding gown with pearl bridal jewelry and a flowing veil will help to set the tone. Traditional bouquets, such as white roses dotted with tiny white stephanotis are perfect for the bride and her attendants to carry. The cake can also be a classic beauty, with accents such as delicate white sugar flowers, elegant scrollwork, or tiny "pearl" dots that resemble the bridal jewelry. A white wedding can also be done in a casual outdoor style. The bride can wear a simple white organza or linen gown, and carry a bouquet of summery daisies. Plump red strawberries can be used with a delicious whipped cream frosting on the wedding cake. Arrange the centerpieces in vintage white vases for a touch of country chic. You can add a bit of texture by using white tablecloths with cutwork borders. It is just the perfect feminine country detail. White can definitely go modern as well. 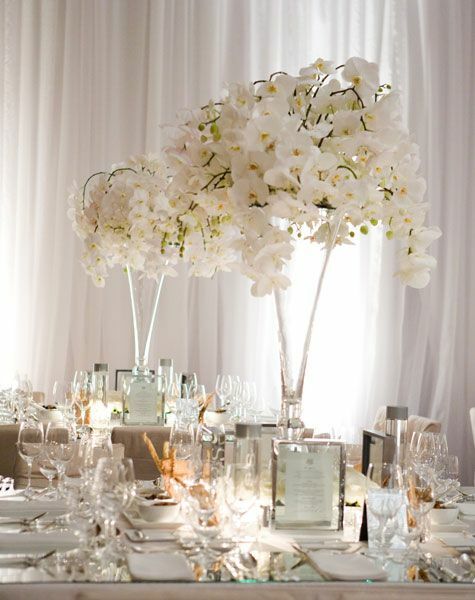 Picture the elegant minimalist style of centerpieces created from fabulous white orchids in tall clear square vases. Très chic. The bridal gown and jewelry can also be streamlined and glamorous. A slinky silk crepe sheath worn with stiletto crystal drop earrings is perfect for this type of wedding. 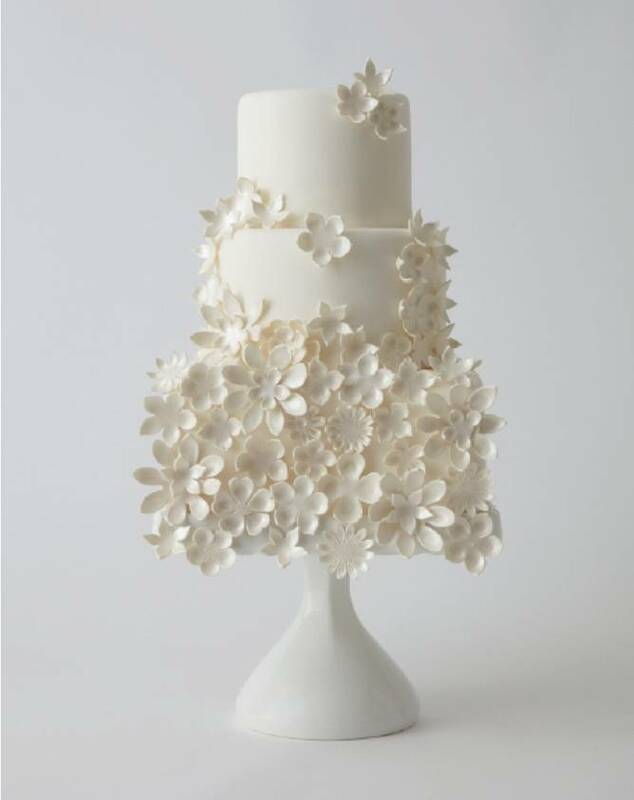 Choose a square stacked tier wedding cake covered in smooth fondant and finished with handmade sugar orchids. If your wedding is to be in the winter, the icy white Winter Wonderland theme is always delightful. 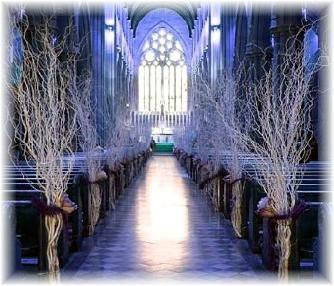 Create a dramatic aisle for the ceremony by lining the bride's path with tall white branches. You can also create a stunning chuppah or canopy by using the white branches to create a structure. Decorate it with white lilies, roses, and even feathers for a dramatic and impressive look. The bride can wear a fabulous gown adorned with shimmering Swarovksi crystals, silver embroidery, and even a fur wrap, if she likes. So you see, there are so many ways to design an all-white wedding that each one can have as much personality and unique style as a colorful wedding. White is, after all, the most classic and timeless color for brides and weddings. The elegance and grace of a white wedding simply cannot be topped.